WES Commuter Rail engineers see pedestrians and even vehicles disregard crossing arms and signs or cross where prohibited every day. It’s illegal and unsafe. An 80-ton WES train traveling at 60 miles per hour takes a half a mile – the length of nine football fields – to stop. Dangerous behavior by pedestrians tends to increase in the summer months when more people are out and about. Transit Police Division officers conduct safety mission along the WES Line to enforce no trespassing in the right of way and educate pedestrians about the risks of trying to beat the train. While the only train strike fatality on the WES system in the last year was a suicide, the number of pedestrians killed in railroad trespassing incidents nationwide rose in 2012 to the highest level in six years: 442 people were killed and 405 more injured. This shows kids trespassing within the fenced, restricted right of way – dangerously close to trains passing at between 40 to 60 miles per hour. This is in the Cook Park/Tualatin City Park area near Tigard/Tualatin. 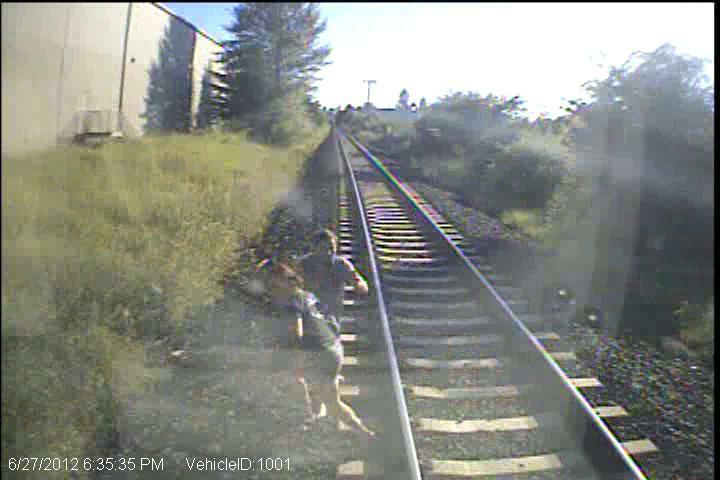 A couple trespassing on the tracks narrowly avoids getting struck by a train. Trains travel about 40 miles an hour in that section of track near Teton Avenue in Tualatin. WARNING:Some may consider this video graphic. A person walking their dogs off leash trespassed in the right of way. While the owner should know better, the dogs did not and one of them was struck by the train. The dog was hurt but survived. This is in the Cook Park/Tualatin City Park area near Tigard/Tualatin where trains run between 40 to 60 miles per hour. Don’t trespass on private property including railroad tracks. Do not walk, bike or play on the tracks or on railroad bridges. Don’t cross the tracks at unregulated crossings or in front of an approaching train. Don’t speed through intersections as crossing gates are coming down. Always obey railroad signage and warning devices. It is illegal to trespass on railroad tracks. Criminal trespassing can be a Class A misdemeanor with a fine up to $6,250 and up to a year in prison. Unlawful interference with a traffic control device or railroad sign; a $427 fine. Failure to stop for a railroad signal; a $242 fine. Obstructing a rail crossing; a $242 fine. Pedestrian failure to obey a bridge or railroad signal; a $97 fine. The 14.7-mile WES line operates weekday rush hour service connecting Beaverton, Tigard, Tualatin and Wilsonville in a 27-minute commute. WES travels an average 37 mph with a maximum of 60 mph.